The news was starkly succinct. On August 27, 2017, Mr. Ismaili, the General Manager of Tehran’s Judiciary announced that Mohammad Ali Taheri, the leader of “the Mysticism of the Circle”, a New Age cult in Tehran, has been condemned to death. The accused’s attorney, Mr. Alizadeh Tabataba’i confirmed the news and vowed to appeal the verdict. The 60 year old cult leader, teaches an eclectic doctrine and advocates a therapeutic practice which he calls “transcendental healing.” The cult enjoys a small following among middle class Iranians. 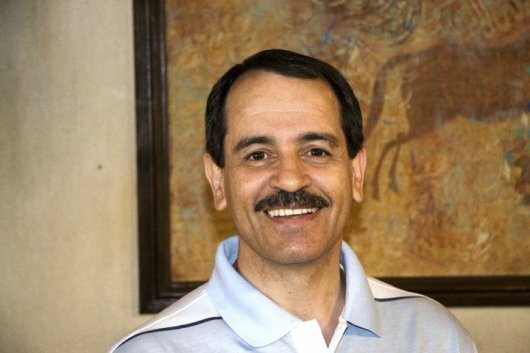 In 2009 Mr. Taheri was charged with “Corruption on Earth” and sentenced to five years in prison. Four years into his sentence, another ominous charge was brought against him: “apostasy” which is, potentially, a death sentence. There is an old academic debate about the effectiveness of civil protest against political and judicial injustice but the consensus is it works under specific circumstances. I can attest that in this case a public outcry can save a life; it can also help fend off Iran’s judicial Clerocracy that haunts its fragile civil society. One does not have to believe in Mr. Taheri’s cryptic creed (I don’t!) to declare he does not deserve to die for his beliefs. The time, however, to make that declaration, loudly and from every hilltop, is now! What happens when apostasy trails go public? Public apostasy trials in Iran, contrary to the general belief, have been infrequent. Indeed, there have been only two “public” trials conducted on these grounds. Both have ended with the conviction of the accused. Both were revoked later. The key word here is “public.” Apostasy trials that have gone public have ended in favor of the accused. On September 13, 2000 Tehran prosecutor for the Special Court of the Clergy, read an indictment against Mr. Hassan Yousefi Eshkevari, a reform-minded Iranian cleric, who had argued that Islamic laws are time-bound, not eternal. The court subsequently tried and condemned Mr. Eshkevari to death for apostasy. After Mr. Eshkevari was sent to prison to await execution, there was an outcry against the verdict. Ayatollah Montazeri (1922-2009), a prominent dissident jurist excoriated the death sentence. Subsequently, the influential “Association of Progressive Clerics” announced that the judge and the prosecutor of the trial must themselves stand trial for their unjust verdict. A public uproar ensued. Two years later the appellate court, under the gavel of Mr. Ali Razini, overturned Mr. Eshkevari’s death sentence. On November of 2002 an Iranian Reform intellectual, Hashem Aghajari, delivered a sharply anti clerical speech in the city of Hamedan. Subsequently, a provincial court in that city indicted, tried and condemned Mr. Aghajari to death for apostasy. The sentence brought sharp protest from civil and clerical authorities. Jurists, journalists, and opposition politicians expressed “dismay,” “bewilderment,” and “anger” over the charges of apostasy against Mr. Aghajari. There were widespread street protests against the court sentence delivered to Aghajari. Consequently, Iran’s Supreme Court, in an attempt to dispense with this case, returned Aghajari’s dossier to the Hamadan court for reconsideration. The court, however, refused to rescind the verdict. Citing legal irregularities, then, the Supreme Court reassigned the case to a court in Tehran, which unceremoniously threw out the conviction. It is important to remember that in both these cases, there were multiple rejections of the verdict by jurisconsults, followed by public protests and wide media coverage. The combined effect of the above made it all but impossible for the prosecutors to carry the day. These outcomes show that the judicial zeal for prosecution in such cases, has not withstood the pressure of the Iranian civil society’s belief in individual autonomy and human rights. In other words, once the issue gains publicity, the society’s high moral and normative standards (enshrined in the article 23 of Iran’s constitution) short circuits provisions of punishment for “apostates” and “blasphemers” specified in the article 513 of the penal code. What happens when the blasphemy trials do not catch the public eye? On September 23, 2014 Mohsen Amiraslani Zanjani, a 28-year-old self-styled religious counselor and soothsayer was executed on charges related to blasphemy. The charges against Zanjani were murky and inconsistent. Apparently, during trial, Mr. Amiraslani had questioned the literal Quranic (and biblical) account of Prophet Jonah’s survival in the belly of a whale, thus opening himself to the charge of “insulting a prophet”. The accused was condemned to death. Although the initial charge was not apostasy and although the initial verdict was struck down by appellate courts, the relative obscurity of the accused and lack of a vigorous public campaign on his behalf led to the eventual ratification of the initial court’s verdict. Amiraslani’s tragedy is truly Kafkaesque. Deprived of the notoriety that may have saved his life, he wandered the deadly maze of Iran’s criminal justice system until he ran out of luck. Will Mohammad Ali Taheri end up dangling from a nylon noose, like Amiraslani, or will he live to see another day, like Eshkevari and Aghajari? Will the hanging judges of Iran’s rogue judiciary have their way with Mr. Taheri or will they be driven back by a surge of support for human and civil rights? The precedent shows that only a spirited public outcry can save Mohammad Ali Taheri’s life. It can also hearten Iran’s embattled civil society. The appellate for the August 17th verdict meets on September 16th.